When Family Friendly Gaming went over the launch titles for the Playstation 4 there was only one game that looked even remotely close to being family friendly. That game is KNACK. Putting it in the family friendly bucket may be a bit of a stretch too since it is rated Everyone 10+ by the extremely lenient ESRB. The descriptor for KNACK is Fantasy Violence. Family Friendly Gaming has already seen enticement to lust in early testing of this Playstation 4 (PS4) home console video game as well. Initial thoughts on KNACK are it is not worth the $40.00 US dollars we spent on it. Yes we found it on sale. 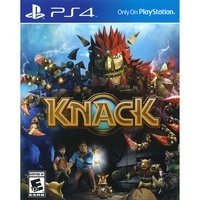 Regular price for KNACK is $60.00 US dollars. Then of course massive amounts of tax on top of that. KNACK shows that Sony is not properly targeting families with the Playstation 4. Their deceptive practice of not including the Playstation Eye, and failures to provide games for families are well documented. KNACK has to download to the system from the disc, and then install onto the 500 gig system. We got to sit there and watch that ever exciting activity.